We had the invitation to be festive, but ultimately decided to stay in. While we had eager babysitters, neither of us wanted to be transporting Isaac with the drunkards in the early morning. As for the 2nd option, his first overnight . . . it just wouldn't be fair to Isaac or the Grandparents watching him. We're still co-sleeping and I think getting Isaac to sleep well without me would be near impossible. So we made the best out of the evening that we could! 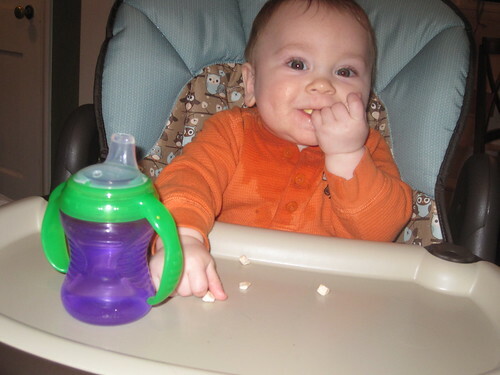 :) Isaac ate some num numms of dried bananas and strawberries. While Tony and I had a verified feast of appetizer goodness. 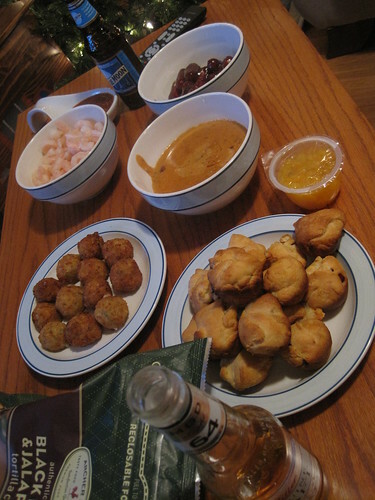 We had some salami pepperjack crescent things that I made up, Trader Joe's rice balls, another made up queso dip, lil smokies in bbq sauce and shrimp with cocktail sauce. I don't even want to tell you how much of this food was eaten, it was all super good! Our plans consisted of watching the Wild, watching Ice Age 3 and finally watching the ball drop. Happy 2010 to the Fontaines and I hope you have a fantastic year! The food looks great and I can imagine that it was all gone by the end of the night, right? We had a very low key NYE too. :) My husband and a friend played Mario on the Wii and I was fighting to stay awake til 12. It was all worth it though! I'm glad I am not the only mother who hasn't left her 9 month old over night yet. Everyone looks at me weird when I tell them Ci hasn't spent a night without us yet. I'm going to do a post about that soon. We pretty much did the same thing. My sister and her b/f came for dinner and we played Wii. I was in bed at 11 because I knew Brayden would be up early! Sounds like the perfect way to bring in the new year to me!